Product Description: The edgewise family of panel meter products were designed to handle applications where panel space is at a premium. 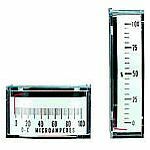 Both the 185 and 280 edgewise series meters may be mounted horizontally or vertically and meet ANSI C39.1. The Yokogawa line of edgewise meters are accurate to within +-2% of full scale in DC and +-3% for AC and come in a variety of sizes and ratings.